Which Came First, the Wine or the Cuisine? It was during my last trip to Italy while walking through Rome in the Piazza della Rotonda with its fountain and the Pantheon both in view, that I and a couple of very dear friends decide to take a break from our sight seeing and stop for lunch. A little café with tables sitting on the Piazza would allow us to keep our spectacular view while dining. 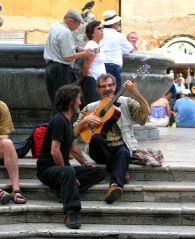 Two men were sitting on the steps to the fountain singing in Italian, one clutching his guitar as it rested on his leg, the other slapping on his knees to keep the beat. It was one of those moments in time that you want to last forever. We ordered an antipasto tray of local favorites, a traditional Roman pizza and some cured olives. To drink we ordered a carafe of the house white wine. It was not an overly complex wine yet it had good aromatic qualities of fresh pear and wild flowers with crisp minerality on the pallet. A Pinot Grigio I thought, but that was not important. As the wine geek (that’s me), the Chef and the Fashionista all sat enjoying this simple lunch with the house wine, we were amazed at how all the flavors came together. While ordering we had decided that we would be drinking white so our menu choices were skewed in that direction. We had a hunch, however, that any dish we ordered would have paired quite nicely with the white vino della casa. This would be a common thread in our dinning experiences throughout the rest of the trip. The local cuisine with the wines of the region would continually blow us away with how perfectly the flavors complemented each other. Were the winemakers crafting a style of wine to complement the local cuisine or were the chefs creating dishes to complement the style of the regional wine? I think it’s a little bit of both, but this was not done specifically for me on this trip. Nor was the Chef and Sommelier conspiring to supply these three random tourists with a perfect food and wine pairing at the cafe. It's quite clear that wine has a rich history in serving as an accompaniment to food. When wine first entered the scene, it was often safer to drink than the local water supply with little thought given to it as a "sensory enhancing" beverage. Over time though, as regional cuisine and local wine-making traditions developed, gastronomy emerged as link between culture, food and drink. This is true wherever you travel or whatever style of cuisine you are enjoying: bratwurst and sauerkraut with a dry German Riesling, thinly sliced Serrano ham with a glass of bone dry fino sherry or boeuf bourguignon with a red Burgundy. Next time you visit your favorite restaurant or travel abroad, select a wine that comes from the same region as your dish and you will be pleasantly surprised how well they conspire to pair beautifully together. It's Chardonnay time! Michael Wray puts this grape in perspective chronicling its origins and use as a wine varietal. Find out why Chardonnay is one of the most widely enjoyed wines out there! 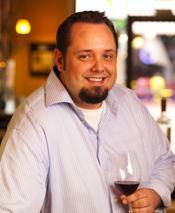 Michael Wray talks about the history and legacy of Pinot Noir. The wine (and food) world is better off for having this little grape! Sparkling wine - gotta love it. Michael Wray explains the three processes of making this bubbly beverage but focuses on the traditional "methode champenoise." Of course, talking about has his limits so Michael indulges the audience on proper opening techniques using a Pinot Noir Brut Reserve from Domain Chandon. Michael Wray of Ceja Vineyards explains the intricacies of decanting a wine and why it's a wonderful tool that can enhance the wine experience. Michael Wray of Ceja Vineyards explains the various wine openers that exist today and how to properly use them. From old school to new school! Michael Wray explains his tasting technique enjoying Ceja Vineyards' 2006 Vino de Casa Red Blend.